Games 26 Mar 2013 06:52 pm by David ! Announcing our partnership with 826LA! This video, and this post, is PART 2 of today’s Kickstarter update! I’m pleased to announce that, thanks to the success of the card game campaign, we will be entering into a partnership with 826LA, the nonprofit writing and tutoring center for kids (mentioned in our last post — save the date for our June 2nd event at 826LA Mar Vista!). 826LA is my local chapter of 826 National, which operates tutoring centers and jokey storefronts in many cities nationwide. Perhaps you’ve seen the Pirate Store in San Francisco, or the Brooklyn Superhero Supply Co.? That’s 826 Valencia and 826NYC, respectively. Similarly, 826LA operates two Time Travel Marts in Los Angeles, where you can come to buy dodo chow, robot emotions, and famous last words. You can also buy books and normal things too! Proceeds from the stores support the tutoring centers, which are absolutely free of charge to local schools and individual students. With this in mind, we provide after-school tutoring, evening and weekend workshops, in-school tutoring, help for English language learners, and assistance with student publications. All of our programs are challenging and enjoyable, and ultimately strengthen each student’s power to express ideas effectively, creatively, confidently, and in his or her individual voice. I’m a huge fan of the work that 826 does, and when it became clear that we had an opportunity to help support them, I leapt at the chance. I wanted to announce this partnership earlier, but after we shot the second half of the video above (the part in the Time Travel Mart), I double-checked Kickstarter’s guidelines on charitable donations, and an inquiry to their staff verified that even touching the subject is completely prohibited in every way. I understand this — you don’t want someone on Kickstarter claiming that some percent of their earnings will go to a nonprofit, and soliciting donations that way, when there is no way to hold them accountable that the donation will actually be made, or that the nonprofit even exists. As you can see, the effort wasn’t entirely wasted — it did inspire the GOAT STARE backer tier, which five brave individuals gladly took advantage of! AND THE WORLD IS BETTER FOR IT. The bottom line, though, is that now that the pledge money has left Kickstarter and made its way to us, we can do what we want with it. And one thing we want to do is the following! $382,600 RAISED : We will donate a dollar for every game sold during the Kickstarter to 826LA. That turned out to be 10,938 games (across physical and digital copies both). We’ll round that up — so thanks to your kind support of our project, 826LA will be receiving a cash donation of $11,000! 8260 BACKERS : We will donate Machine of Death product (books + games) to 826 stores nationally at no cost, for them to sell and raise money for their tutoring programs! 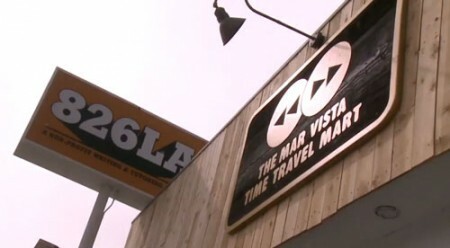 In addition, starting in June, we’ll be creating special 826LA-themed Black Market Gift Cards, and those will be included free with all orders made from the Time Travel Mart online store (perhaps for a limited time or while supplies last, we’re not sure on the details yet). We’re so pleased to have the opportunity to support the great programs offered by this fantastic nonprofit. 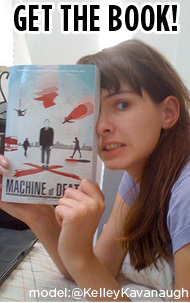 Machine of Death as an entity owes its entire existence to writers, so to be able to encourage kids in their creative writing and help them in school is in the best interest of not just them and the culture at large, but also us — we want more writers to write for Machine of Death Volumes 10-100! SO THIS IS FUNDAMENTALLY A SELFISH ACT. Events &Games &Vol2 Updates 19 Mar 2013 02:45 am by David ! Card game – LAST DAY. Plus more preview stories! Today is the LAST DAY for our card game Kickstarter! To say it has done well is to make an absurd understatement. This game has now done, in pure power points (defined as revenue per unit over time), better than anything else we have ever done. And it’s not even over yet! You can still pledge today and get a boatload of free bonus goodies. Yes. We will bring AN ACTUAL BOAT TO YOU. Full of bonus goodies. Including the new Machine of Death Artbook — a book filled with all the art from both books, including statements from the contributors! 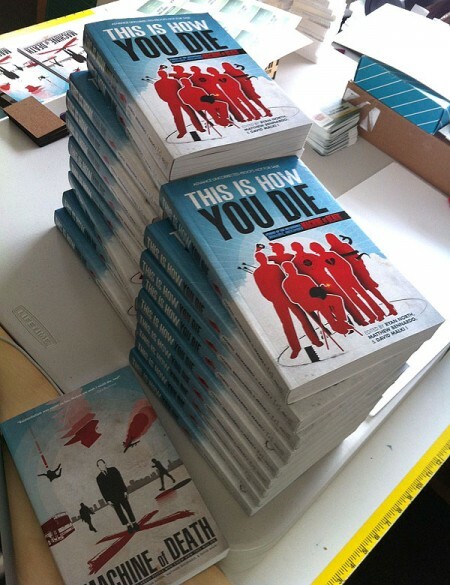 Free to all backers in digital form, and free in physical form to all backers over $35. We were kidding about the boat but not about this book. It’s gonna be pretty great! But perhaps you have already pledged — or have already decided that it isn’t for you! Fine. Here are a few OTHER ANNOUNCEMENTS that may be of interest. Read them! Enjoy them! Share them! Print them out and wallpaper your room. It’s your day. On SUNDAY, JUNE 2, we will be throwing a party (in the tradition of our Talent Show and Variety Show) at 826LA’s Mar Vista Time Travel Mart in West Los Angeles! 826LA is a nonprofit writing & tutoring center for kids in elementary, middle, and high school, primarily serving underprivileged communities. Since MOD wouldn’t be here without writers, we want to give back in a small way and hold a benefit event for the 826LA programs — all of which are free for the kids involved, and which rely on donations. More information about this event will be forthcoming! In the meantime, if you’re in the Los Angeles area, SAVE THE DATE for JUNE 2. And check out our Kickstarter on its last day! If you’re bored, read all the updates. They’re pretty interesting. Thanks to those of you who’ve pledged! We’re very excited about the game and hope you are too!! 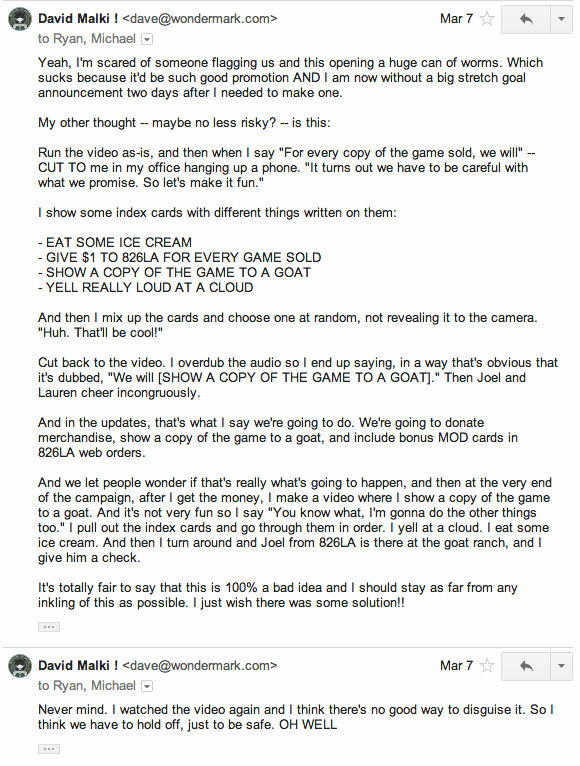 Comments Off on Card game – LAST DAY. Plus more preview stories! Games 26 Feb 2013 03:29 am by David ! We launched our Machine of Death card game Kickstarter a little while ago, and it’s been nuts! The above is a real tweet from the official Cards Against Humanity account, linking to our our pitch video (which I think came out really great!). And there will hopefully be more to come, thanks to the kind backers who’re supporting this game! It’s a super fun (if somewhat morbid) party game that I’ve had a lot of fun developing with Kris and others. To give you a better sense of some of the mechanics of the game, here’s a video from one of our playtest sessions. Hope you like it! I’ve been posting all the Kickstarter updates (of which there are now ten separate posts) to the Machine of Death Facebook page, as well as announcing them on Twitter, so there are ways to get INSTANT NOTIFICATION OF ALL NEWS if you so desire! Games &merch 13 Oct 2011 11:48 pm by David ! 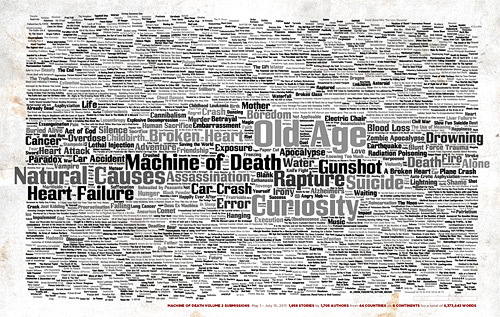 I made a graphic with (as best as I could manage) the titles of all 1,958 submissions to Machine of Death Volume 2. 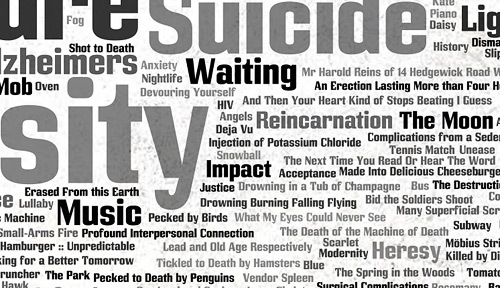 The bigger the text, the more common the title among the submissions. Here’s a PDF (10MB) for an even closer look! Can you find yours? The coolest thing about seeing all the titles laid out like this is the feeling of world that it evokes — knowing that these are all stories; that each title, no matter how strange, has an explanation, a set of characters for whom those few words mean everything… it’s incredible. It’s like looking at a map of a country you’ve never been to, and using the names of landmarks to imagine what it must be like. It feels real. And you are to thank for that. The graphic is also available as a handsome poster print. The MOD philosophy, so far as I’m concerned, is “don’t worry about it — just make things that are interesting.” SO FAR SO GOOD. My favorite recent example are our Death Prediction Card Sets! There are several different themed sets, good for all sorts of different things. Our Card Games Rulebook is a good place to start! Our diligent game testers have also been weighing in with feedback on the Game Forum — where we invite your feedback as well — and they’ve also been suggesting new and interesting games to play. So I’d like to invite you to another game testing event, tomorrow afternoon, to try out some of the new games! Saturday, October 15, from 1pm till 3 or so, in West Los Angeles. And free pizza too! If you’d like to attend, please RSVP in the comments and I’ll send you directions. If you came last time and would like to come again, you’re welcome to! We’ll be playing mostly different games this time around. 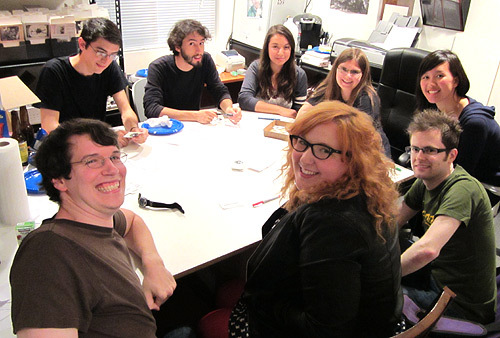 Look at all these happy people that came to the last game testing events! Games &merch 10 Sep 2011 03:20 am by David ! UPDATE: Due to some kind of feed error, this post is showing up for some people a week late. SPX was the weekend of Sept 10-11, and the game testing was Sept 13-14. We’ll do more gaming events soon! All the other info is correct. This weekend Matt and I are at the Small Press Expo in Bethesda, Maryland, along with nearly a dozen of the Machine of Death artists! We’ll be signing books, administering free prediction tests, and offering — for the very first time — Official MOD Game Card Decks. Recently we mentioned we were working on a Machine of Death card game. This is a bit of a simplification — it’s only true if you consider a deck of Hoyle cards to be a “card game.” What we have created, instead, is a series of card-based game kits. When I first printed up the Machine of Death prediction cards, I only expected that an average person might encounter the cards singly — you might get one with an order from TopatoCo, or maybe you sent away for one by mail (offer still valid! ), or perhaps you had a prediction test performed in person by us. But when I picked up the order from the printer, and fanned out all the different cards to look them over…it felt an awful lot like I was holding a deck of playing cards. But a deck of prediction cards isn’t a game in the way that Uno is a game, or Apples to Apples is a game, or Magic: The Gathering is a game. There are no inherent rules or logic to the cards; they’re just inert items, props waiting to be imbued with meaning. A stack of prediction cards is like a deck of regular playing cards, or a set of dice, or poker chips: tools. This is incredibly exciting, because it suggests that there isn’t a “Machine of Death card game.” What there could be is an entire Machine of Death dimension of games. And we’re really, really excited to tap the collective gaming consciousness to see how many fun and amazing things sufficiently creative people (like us, and you, and everyone reading this) can do with a simple set of MOD prediction cards. • We’ve designed and printed four decks of prediction cards. “Set A” and “Set B” are each collections of 50 cards each, with general predictions ranging from “OLD AGE” to “SAWBLADE” to “HUBRIS” to “SKIN FALLS OFF.” In addition, we have created four themed sets (“Pirate”, “Adventure”, “Space”, and “Noir”) of 25 cards each, and packaged them in pairs. So these are two more 50-card decks, each containing two sets of 25 themed cards. 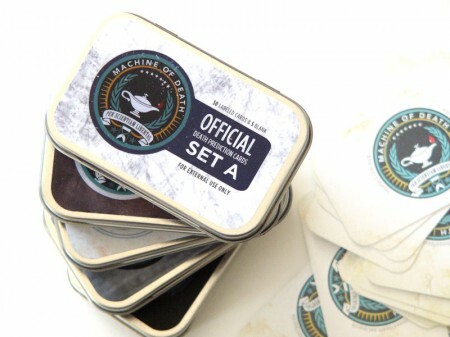 Each deck comes packaged in a sturdy tin for easy transport. • Every death on every card has been given unique attributes: Drawability (a difficulty handicap for games like Draw & Guess), Likelihood, Painfulness, and Epicness. Since these attribute values vary from card to card, they may be used in gameplay. • Every deck also comes with five blank cards (identical backs to the other cards, but unprinted fronts). These cards may be used as wild cards, or may be customized by the user into unique deaths, or even some entirely different type of card! Also available will be a complete set of 50 blank cards, to allow players to do more extensive customization. • So far, we’ve devised a list of around 15 games that we’re currently play-testing. Some are simple adaptations of existing games (such as Draw & Guess). 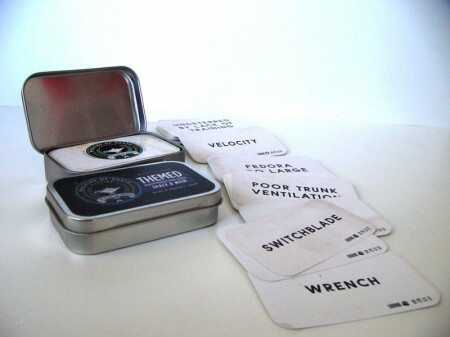 Other game types that the cards lend themselves to are memory games, storytelling games, debate games, and (using two identical decks) matching games. Not all the ideas are ready for prime time just yet; many will require further testing. But we’ve set up machineofdeath.net/games as a sort of Master Rulebook, to share the rules for the games we think are great so far — and we’ll be adding more new rulesets there as our testing continues. • We also think there’s totally potential for MOD cards to be used in a role-playing context, or as part of a more elaborate combat-type game that might require the creation of more classes of cards or other additional material. These are advanced ideas that we’re hoping to workshop over time (and we’d love to hear your ideas too). We encourage you to add MOD cards to your existing gaming and see if they can add a new dimension anywhere. There is no game, from Solitaire to Settlers of Catan, that couldn’t be deliciously upgraded with the judicious addition of infallible death-predicting technology! 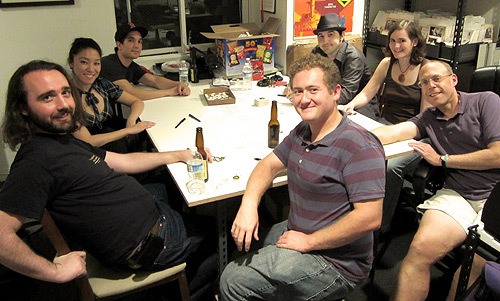 I want to make a special mention of a game that I created called “Hitman on a Budget.” It’s a dice-based role-playing game that I’ve tested a few times now, and it’s super fun with a group of about four to six people. One player gets to be a sort of game leader (the “Bureau Chief”) while the other players are hitmen competing to kill targets revealed by drawing random death cards. I’ve posted the full rules on the Rulebook — and the great thing is, you can play it right now! 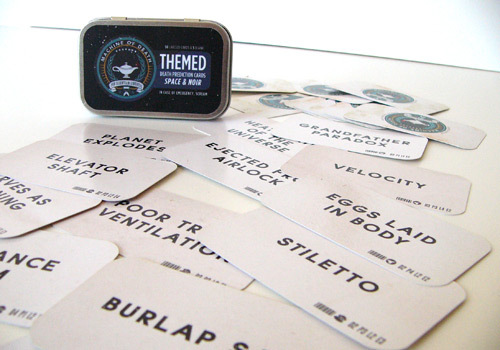 Because it’s a storytelling-based game, the cards are just there to add an element of randomness…but the Bureau Chief can just as easily choose deaths from her imagination, or use random dictionary words. All you need is a pair of dice (or a dice app!) and some friends, and you’re set. Let me know if you find it fun! As I mentioned at the top, we’ll be selling card decks at the Small Press Expo this weekend, and we’re planning to put them up online later this month. Game testers who have already applied through our form will be contacted by September 16 if we decide to use you for this testing round. We’ll also be holding some local play-testing events in Los Angeles throughout the month of September (at the MOD West LA World Headquarters). The first two will be Tuesday, September 13 and Wednesday, September 14 from 8:00 – 10:00 PM. If you’d like to come, please RSVP to either by leaving a comment on this post! We’ll email you with further details. Each event will be limited to 8 people. Feel free to RSVP to both if you know you can make it to both! But please only RSVP if you’re sure you can make it. We’ll have pizza and play some games! It wouldn’t be Machine of Death if we didn’t leave you with a new challenge, right? Of course you know that you can get individual, personal death prediction cards by mail, just by sending in a self-addressed stamped envelope. Robynne has been detailing many of the cool things you’ve sent in, and in fact there’s so much cool stuff here in the office now — much more than we could ever blog about — that she’s now working on creating a Flickr set to show it all off. More on that later on. Create a custom death prediction card, and send it to us. And leave a blank for us to hand-write in a number. Here’s what we’ll do. We’ll take photos of, and blog about, all the cool cards we receive. Then we will insert them randomly into MOD card decks for other people to find. If someone finds your card in their deck, we’ll give them a prize. If you include a SASE, we’ll send you back a li’l thank-you too. Start working right away, because we want to start shipping these decks this month! Leave a comment if you have any questions! Now…go play “Hitman on a Budget”!